Charged with learning to listen, small-town Vermonters hear new notes in themselves in Annie Baker’s captivating drama-class drama. Deceptively little happens in Baker’s enchanting 2009 play about small-town Vermonters taking a community-center drama class—if you don’t count five lives being forever changed, that is. The young New York playwright takes us through six weeks of acting exercises presided over by Earth-mother-figure Marty (Roman). We catch glimpses of each class in brief, elliptical blackout scenes; Marty’s charges include her ex-hippie husband, James (Lauck), recently divorced carpenter Schultz (Key), New York transplant Theresa (Myers) and overachieving 16-year-old Lauren (Gray). As they self-consciously open up to one another in Marty’s transformation games, we see them begin to transform each other in more lasting ways. The forward action is propelled by Baker’s painstaking reveals of her characters’ back stories or of what’s happened between them since the last week’s class. Her dialogue is almost uncomfortably naturalistic: These people don’t speak in sparklingly crafted witticisms; they unveil their inner lives in half-hewn sentences and awkward silences. While Marty encourages her aspiring self-improvers to get out of their own heads, Bullard and his hugely appealing cast get right inside them. Given the tools to inhabit the lives of others, to listen and observe, these five characters discover new aspects of their own. 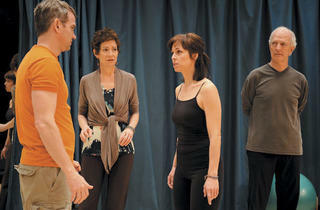 “I felt seen,” one says as part of an advanced exercise late in the play. She’s not speaking about what the class has done for its students, but she could be.